Like many of the students who documented the METRO Green Line’s construction as part of a special class at Gordon Parks High School, Khalaun Phillips viewed light-rail construction as an unwelcome inconvenience. Now that work has come to an end, he looks at the project a lot differently. “I learned a community needs things that bring people together and the train does that,” Phillips said during a recent visit to the school, which sits on University Avenue just east of the Green Line’s Hamline Avenue Station. Philips’ change of heart came partly from his involvement in the school’s “Transitions” class. For the last several years, students in the class have interviewed residents about what life was like on University Avenue and what they think the Green Line will mean for the community in the future. The results are collected on the Minnesota Historical Society’s website to be preserved for future generations to look back on. 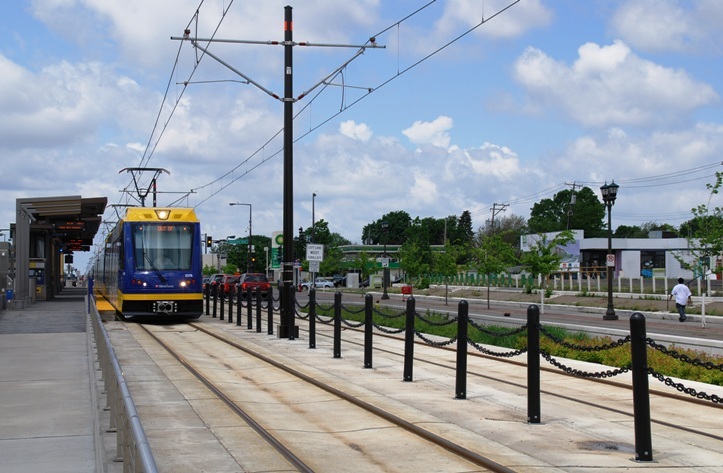 Only time will tell how the Green Line will shape the area around Gordon Parks and Hamline Station, but as light-rail trains begin carrying passengers up and down University Avenue it’s already evident the area is poised for change. Several vacant auto dealerships are being redeveloped to provide new housing and retail space. Small businesses are cropping up along University Avenue and in the surrounding neighborhoods. And immigrants who have settled in St. Paul are bonding together to support one another and promote their distinct cultural offerings. Among the most visible signs of change can be found just north of Hamline Avenue Station, where Minneapolis-based Project for Pride in Living will begin construction this summer on a vacant property once used as an auto dealership. PPL’s $28 million Hamline Station project includes two buildings that will together include 108 new apartments, as well as commercial and retail space and a courtyard. Barbara McCormick, PPL’s director of housing, said the project is mean to serve working-class residents who live in the community and want to take advantage of being near transit. Already, it’s clear the demand is strong for such housing. “The calls have been coming in since the sign went up,” McCormick said. West of Hamline Station, a vacated showroom is being converted into retail space. East of the station, at University Avenue and Griggs Street, another old dealership is being renovated into a new Goodwill store. Not every change around Hamline Avenue Station is coming in the form of new construction, though. Seeing opportunity from the Green Line, several African business owners banded together in late 2013 to launch a new marketing and branding campaign for the Little Africa district. The idea is to promote the cultural district as a destination for visitors traveling through the corridor on the Green Line. The district covers area south and north of University Avenue between Fairview Avenue and Syndicate Street. “We want people to know they don’t have to travel to Ethiopia to experience Ethiopian culture, because it’s right here in their backyard,” said Gene Gelgelu, one of the effort’s organizers. One of the businesses included in the effort is Flamingo Restaurant, located a block east of Hamline Avenue Station on Syndicate Street. Beyond bringing in new customers, Kebede said she and many of those who work at the restaurant will be able to commute to and from work on the Green Line. Kevede lives in Frogtown and will travel between Hamline Avenue Station and the Capitol/Rice Street Station. Students from Concordia University-St. Paul will also likely be traveling between Hamline Avenue Station and the Capitol/Rice Street Station, said Jason DeBoer-Moran, the school’s director of marketing and communications. Political science students often travel to the Capitol with rented vans but will now be able to make less than a half mile to Hamline Avenue Station and ride the train instead. The trips are just one example of how Concordia’s 3,600 students will use the Green Line, said DeBoer-Moran, who lives in the neighborhood and himself will use light rail. 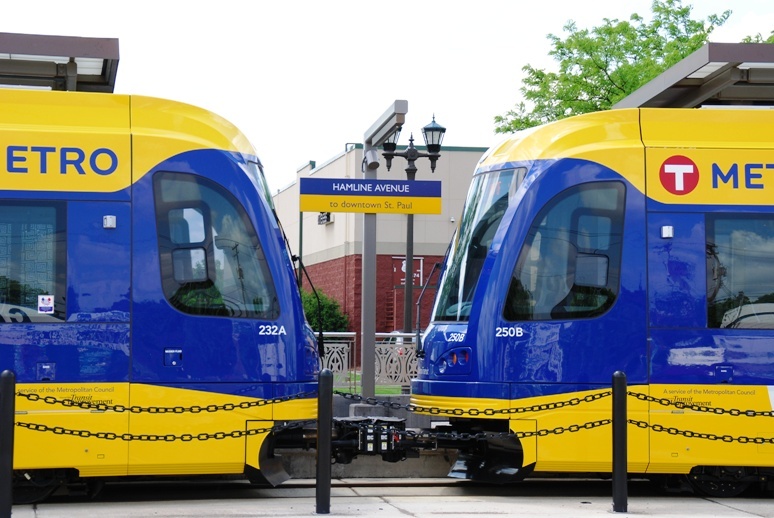 Students can also use the Green Line to travel and from campus, to internships along the Green Line corridor and to reach downtown St. Paul and Minneapolis. Connecting bus routes: Route 21, with service from Uptown Minneapolis to downtown St. Paul on Lake Street, Marshall, Snelling, University, Hamline and Selby avenues. Route 16, with service from downtown St. Paul to the University of Minnesota on University Avenue. 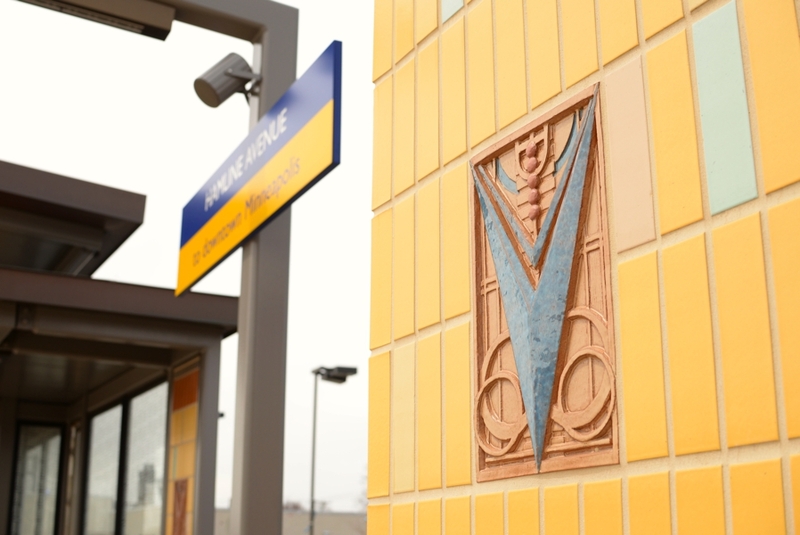 Public art: Minneapolis artist Foster Willey and his brother Guy combined Terra Cotta, hand-made glazed tiles and other materials to create what they call “Hamline Prairie Station.” The work is inspired by Prairie School Architecture, a popular Midwestern style that draws on the natural environment. “I have always been drawn to the combination of geometric and organic forms that define the Prairie style,” Foster Willey said. “The station provides a modern context for new designs that are both original and complimentary. Area landmarks: Concordia University-St. Paul, Central High School, Dunning Recreation Center, James Griffin Stadium, Skyline Tower, Gordon Parks High School, HealthParners Center for International Health, Galtier Community School, Leap High School, Hamline Park.